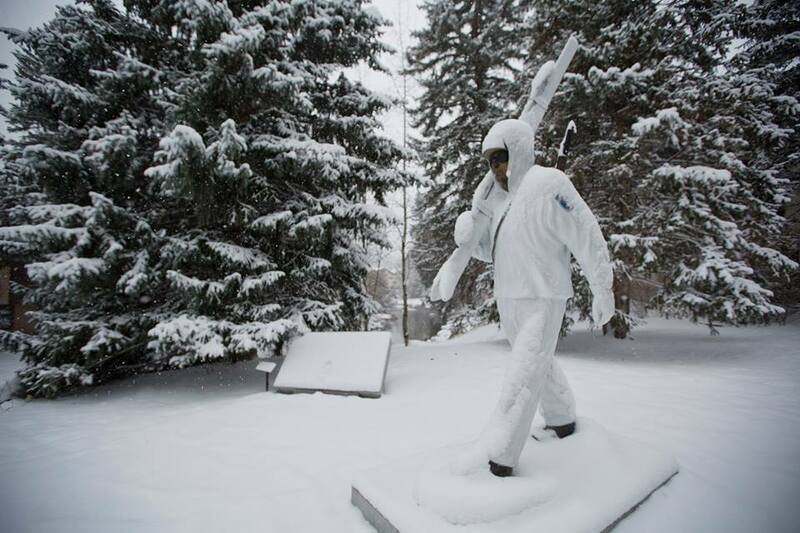 New snow on the 10th Mountain Division Ski Trooper statue by the Covered Bridge in Vail on Veterans Day (Vail Facebook photo). Vail and Beaver Creek ski areas both reported about a half a foot of new snow as of 5 a.m. Wednesday, although it was still snowing hard at 10:30 a.m., so those snow totals will jump up. The new snow this week comes on top of nearly 2 feet the week before, generating some serious early-season excitement in Colorado’s high country. Five ski areas are up and running as of Wednesday, including Wolf Creek, which reported 10 new and is now fully open with a 32-inch settled base, and Copper Mountain, which reported 7 new. Arapahoe Basin and Loveland both reported 10 inches of new snow with snow continuing throughout the morning Wednesday. After the mid-week storm, Colorado is expected to dry out for the weekend before another storm churns into the state late Monday, followed by yet another storm later in the week when Vail opens for the season on Friday, Nov. 20. Vail Resorts’ Breckenridge ski area opens this Friday (Nov. 13), and Beaver Creek opens on Wednesday, Nov. 25. Aspen Mountain officials announced Wednesday afternoon that the ski area will open for a special preview weekend Saturday and Sunday, Nov. 14-15, which is 12 days earlier than the scheduled opening on Thanksgiving Day, Nov. 26. Three lifts and more than 100 acres of terrain will be available. Besides Keystone, Breck and A-Basin, two other Vail Resorts’ ski areas on the Epic Pass will be up and running this weekend with the recent announcement of early opening days for Heavenly and Northstar in the Lake Tahoe area of California and Nevada. Both will now open on Saturday, Nov. 14, instead of Friday, Nov. 20, as El Niño has delivered so far in drought-stricken California, depositing more than 3 feet of early-season snow. Another in a series of intense winter storms will make for this season’s first hat trick for skiers across Colorado, Utah and Lake Tahoe, where some of the most popular ski resorts are opening at a record pace. This storm has had its biggest impact in the Lake Tahoe area, where Heavenly, Northstar and Kirkwood will all open on Saturday, November 14 – six days ahead of originally-scheduled opening days for the Best of Tahoe resorts. All three resorts each have already received about three feet of snow overall this pre-season, including six additional inches from this past storm and more than two feet at Kirkwood’s summit. Mother Nature’s work combined with around-the-clock operation from the West Coast’s two largest snowmaking systems at Heavenly and Northstar has set up a trifecta of the best snow surface conditions in Lake Tahoe. Kirkwood will be the first resort in the region to open with expert terrain. Also celebrating eight inches of fresh snow, Park City will open Saturday, Nov. 21 – debuting this season as the largest ski resort in the U.S. Park City is transforming the mountain experience this season with over $50 million in resort improvements to link Park City and nearby Canyons and form one, 7,300-acre resort. The improvements, including the new Quicksilver Gondola and Miners Camp Restaurant, will be complete in time for the 2015 Christmas Holiday. Track Park City’s progress at parkcitymountain.com. Winter weather continued in Colorado, blanketing Vail, Beaver Creek, Breckenridge and Keystone, with nearly 10 inches of Colorado’s famous powder. Skiers and snowboarders are celebrating Keystone, which opened for the season last week; and Breckenridge, which is busily preparing to open Friday, Nov. 13. Vail is scheduled to open Friday, Nov. 20; Beaver Creek opens just before Thanksgiving, on Wednesday, Nov. 25. Vail Resorts’ Epic Pass grants skiers and snowboarders unlimited, unrestricted access to these snowy western destinations. It’s the only pass granting its holder the true flexibility to ski as much as they want, whenever they want, and to chase the powder as it moves across the U.S. At $809, the Epic Pass pays for itself in less than five days of skiing or riding. With more than 32,000 acres of skiing and snowboarding terrain, this pass can’t be beat. It features unlimited, unrestricted access to Vail, Beaver Creek, Breckenridge, Keystone and Arapahoe Basin in Colorado; Park City in Utah; Heavenly, Northstar and Kirkwood at Lake Tahoe; Perisher in Australia for the 2016 season there; Afton Alps in Minnesota; Mt. Brighton in Michigan; and up to five free consecutive days when staying at in-resort accommodations at Verbier, Switzerland. No restricted dates. A child pass (ages five to 12) is $419. The last day to purchase an Epic Pass is Nov. 22, 2015.